Amidst great fanfare, the folks at Google Fiber announced a few years ago that they were bringing their ballyhooed product to North Carolina’s largest city. The ultra-high-speed service was going to revolutionize the way consumers in the Charlotte area (where I have lived since 2010) use the Internet and television. Google Fiber remains available in only a few pockets of town. There have been numerous problems, from broken water mains to buckled pavement to severed gas lines. Google Fiber’s parent company, Alphabet (GOOG, GOOGL), has put expansion of the service on hold. 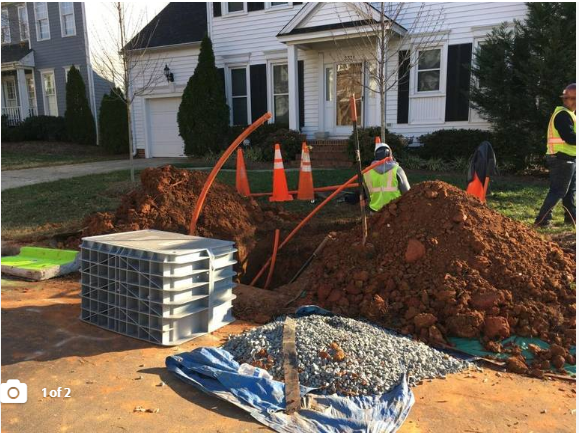 And most Charlotte-area residents are sticking with — or turning back to — old-school Internet/cable companies. Similar stories have played out across the country, and the situation helps illustrate why Comcast (CMCSA) remains both the major player in the industry and an attractive investment. 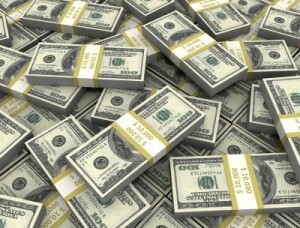 Come Tuesday, Jan. 29, I will use about $1,000 of Daily Trade Alert’s money to buy Comcast shares for our Income Builder Portfolio. CMCSA will be the IBP’s 23rd position, and it will join Disney (DIS) and AT&T (T) as part of the portfolio’s holdings in the new Communication Services sector. In selecting Comcast as his Dividend Growth Stock of the Month for October 2018, my DTA colleague Dave Van Knapp did a comprehensive study of the company. Although I do quite a bit of updating in this article, it would be redundant to rehash everything, and I highly recommend that those interested in CMCSA as a potential investment check out Dave’s work. The vast majority of U.S. homes today can receive fixed-line Internet access service from only two providers: the traditional cable or phone company. Across nearly half of the U.S., that cable company is Comcast. The cost to enter this market is enormous. While technological developments have made it possible to build more efficient and reliable networks than legacy providers possess, deploying these technologies still requires heavy construction spending, while also overcoming the regulatory hurdles that municipalities often impose. Assuming successful network construction, entrants then face steep customer acquisition costs and startup losses as they attempt to gain share, typically with a modestly differentiated product at best in a rapidly maturing market. Several firms have attempted to enter the fixed-line market over the years, but failures far outnumber successes. Most notably, Alphabet sharply curtailed its Google Fiber plans in 2016 after six years of effort ended with likely less than 1% of the U.S connected, despite the firm’s deep pockets. 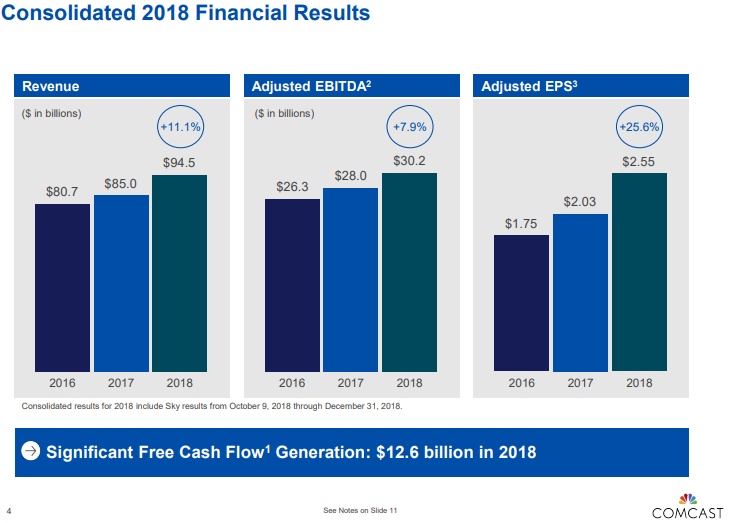 In great part as a result of these economic advantages, Comcast posted a better-than-expected fourth quarter — which capped off a year of extraordinary growth, as shown in the following slide from its Jan. 23 earnings report. 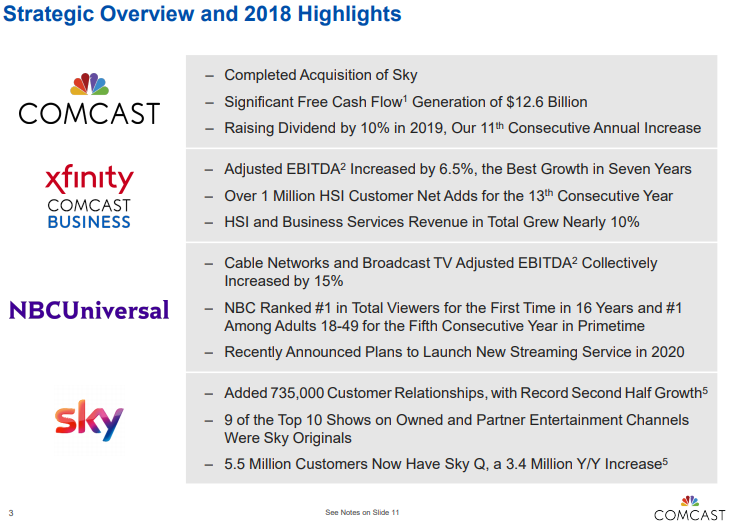 Comcast added millions of customers as users to its various operations, including high speed Internet (HSI), cable, NBCUniversal operations and business services — not to mention the significant expansion into Europe with the acquisition of Sky. A full transcript of Comcast’s earnings report can be found HERE, and the company’s slide show is HERE. Comcast has been an earnings-growing powerhouse for many years. The following FAST Graphs image shows that EPS not only has grown year after year, but almost always by double-digit percentages. More earnings growth is expected in the future (red circled area). 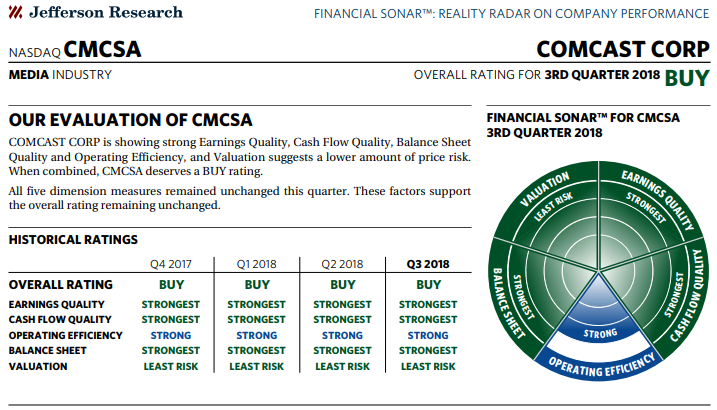 The strength of CMCSA’s operations is expressed nicely in this Jefferson Research “Financial Sonar,” which has not even been updated yet with the outstanding Q4 results. 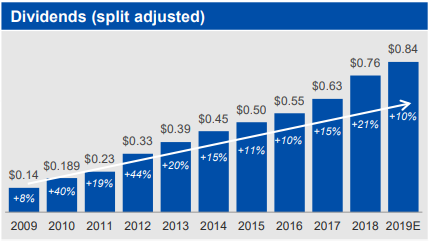 Given that the IBP is, at heart, a Dividend Growth Investing-based portfolio, I like Comcast’s commitment to increasing its payout to shareholders. As you can see by the above chart, Comcast has raised its dividend aggressively for more than a decade. The company just announced another 10% hike for the next year beginning with its April 24 payment of 21 cents per share (up from 19 cents). That pushes CMCSA’s dividend yield to about 2.3%. Last April, when I was contemplating various possibilities for the IBP, I selected Disney instead of Comcast — not necessarily because I “liked” DIS more, but because I thought it was a slightly better value at the time. 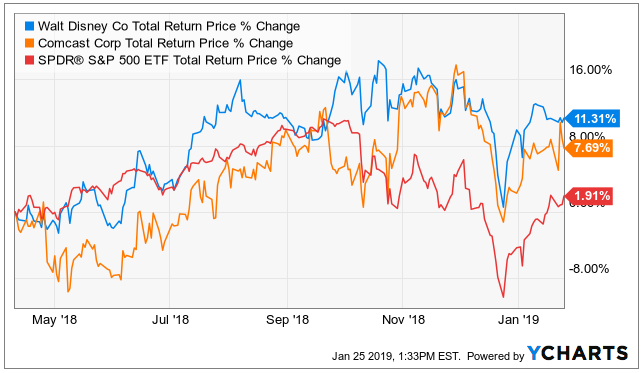 Since I executed the DIS purchase on behalf of DTA on April 10, both companies have performed well on a total-return basis, with Disney gaining about 11%, and Comcast advancing approximately 8%. Each has beaten the bejeepers out of the S&P 500 Index. That’s not why I put both companies on my 2019 IBP watch list, but it didn’t hurt. 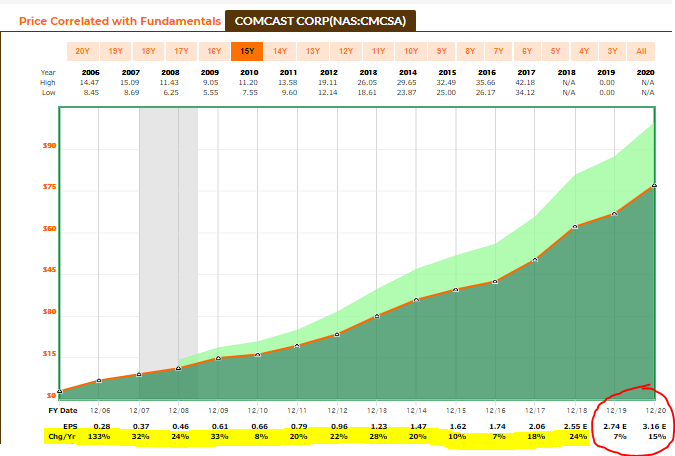 Although I can’t predict with any certainty that Comcast will continue to outperform the market so convincingly, I do believe CMCSA is a high-quality business that deserves a spot in our Income Builder Portfolio. One thing I am willing to predict: Comcast (and Disney, for that matter) will continue growing dividends for years. 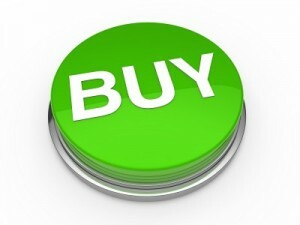 My next article, to be published on Wednesday, Jan. 30, will recap our CMCSA purchase. 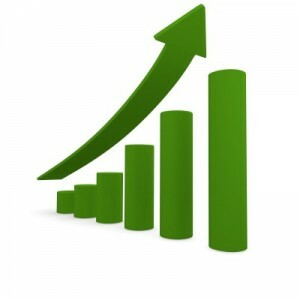 It also will look at the company’s valuation and other pertinent information. 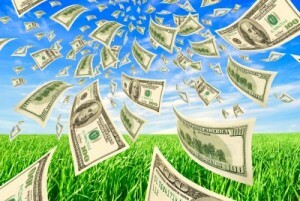 A big shift is coming to the cannabis market - and investors who position themselves properly over the next few months could see windfall profits. Click here for more.